When is an IMAX not an IMAX? IMAX's new digital screens are causing problems in the US, where one comedian Aziz Ansari believes he was short-changed when he went to see Star Trek at one of the cinemas. The reason: the screen size is much smaller than original IMAX screens, due to the technology, which has caused Ansari to have a massive rant on his blog (warning: NSFW language). "I went with a friend of mine to see Star Trek: The IMAX Experience at the AMC Theatre in Burbank today," states the blog. "I drove out of my way to see the film on the large IMAX screen and paid an extra $5 for the ticket, which felt worth it at the time. "HOWEVER, we get in the theatre and it's just a slightly bigger than normal screen and NOT the usual standard huge 72 ft IMAX screen. I was very upset and apparently this problem is happening all over at Regal and AMC theatres." The CEO of IMAX responded to Ansari's blog and told Mainstreet.com: "IMAX did 15 per cent of Star Trek's total domestic box office in the whole country on only 138 screens. "This is compared to the earlier releases of Watchmen, where we did 12 per cent of the box office and Monsters and Aliens, where we did around 10 per cent. Clearly a lot of people are going back to IMAX theatres." He continued: "The overwhelming majority of comments on that guy's blog this morning, more than 90 per cent of them, are vehemently disagreeing with him. And consumers are confirming this with their continued purchases of tickets." The smaller screens are all part of a new projection system put in place by IMAX last year in the US. 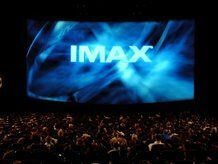 TechRadar was present at the unveiling of the first digital IMAX cinema in the UK back in December. At the launch, we spoke to Executive Vice President Larry O'Reilly of IMAX and he said about the screens: "Not only is this digital system unique and dynamic today, but our engineers are already working to improve the system for the future with software upgrades that will allow you to bring new or enhanced experiences to the theatre without having to change the hardware. "Real time concerts and sporting events that will look like IMAX and IMAX 3D are not that far off at all."